From his humble beginnings as a character in a comic strip to a full-blown pop culture sensation making several appearances as a live-action hero on the big screen, Popeye the Sailor Man is known around the world for his big muscles and love of leafy green spinach. Not only has Popeye become a household name over the years, but so have the cast of characters who join him in his adventures (or misadventures) such as Olive Oyl, Bluto, and Swee’Pea. Though his popularity a has ebbed and flowed over the years, his stake in our pop culture history is undisputed. And if you think otherwise, you’ll have to take it up with Popeye’s biceps! Now you can show everyone what they would look like if they would just eat their spinach! Make the other sailors jealous when you show up to the party with these mighty muscles. 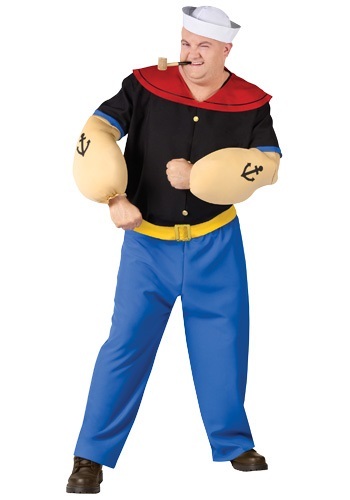 This Plus Size Popeye Costume will make you the toughest sailor aboard the ship. This officially licensed costume comes with blue pants that have an elastic waist for a comfortable fit – I mean, you have to let your muscles breathe, right? The polyester black top has short sleeves with gold buttons with an attached red collar for that signature Popeye look. The padded arm muscles complete with tattoos are really what makes you the classic character. Don’t forget to put on the included belt and sailor hat – a sailor can’t leave port without his hat!